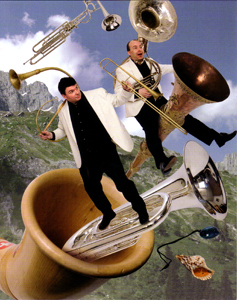 Travelling by Tuba is one of the UK’s busiest and most successful classical music duos. Formed seventeen years ago, they now perform in excess of 200 concerts a year, playing venues such as the Barbican Centre, St. David’s Hall and the Bridgewater Hall. They have recorded three CDs, releasing their third album on the Polyphonic label in 2006. The group has appeared regularly on BBC Radio and television and for many of the independent networks. Travelling by Tuba are selected artists for the Making Music Concert Promoters Network for 2009/10. Travelling by Tuba has developed a highly successful award-winning education programme suitable for children of all ages. It has been featured on Channel 4 on their Okey Cokey Karioke programme and in the Times Educational Supplement. Recently, they commissioned a childrens’ operetta ‘The Tuba Has Landed’ from the composer Robin Grant which had six performances as part of a year-long project in Blackpool schools.